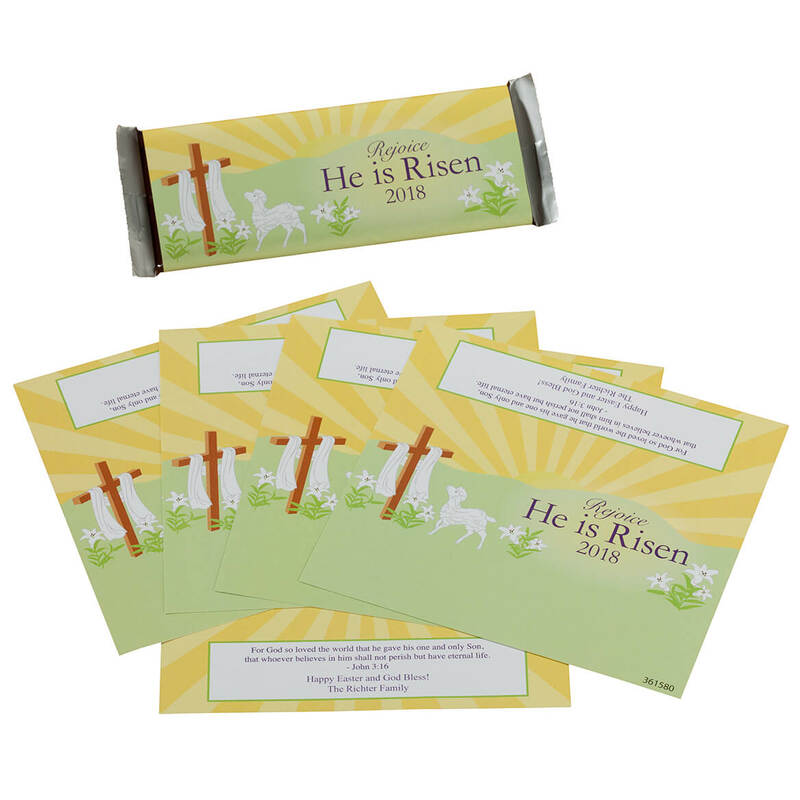 Celebrating the sweet Easter news, these personalized candy bar wrappers feature an empty cross with the words “Rejoice. He is Risen”—and will be personalized with your custom message in back. The back of the personalized candy wrapper also includes the scripture verse John 3:16, and we’ll print your personalized message of love just below. Specify message; limit 2 lines, 40 letters/spaces per line. Pre-printed with the year 2018, the beautifully detailed paper wrappers fit standard size candy bars and easily fold together for quick assembly. Set of 24. Each custom candy wrapper is 5 1/2″ long x 5” wide. Candy bar not included. 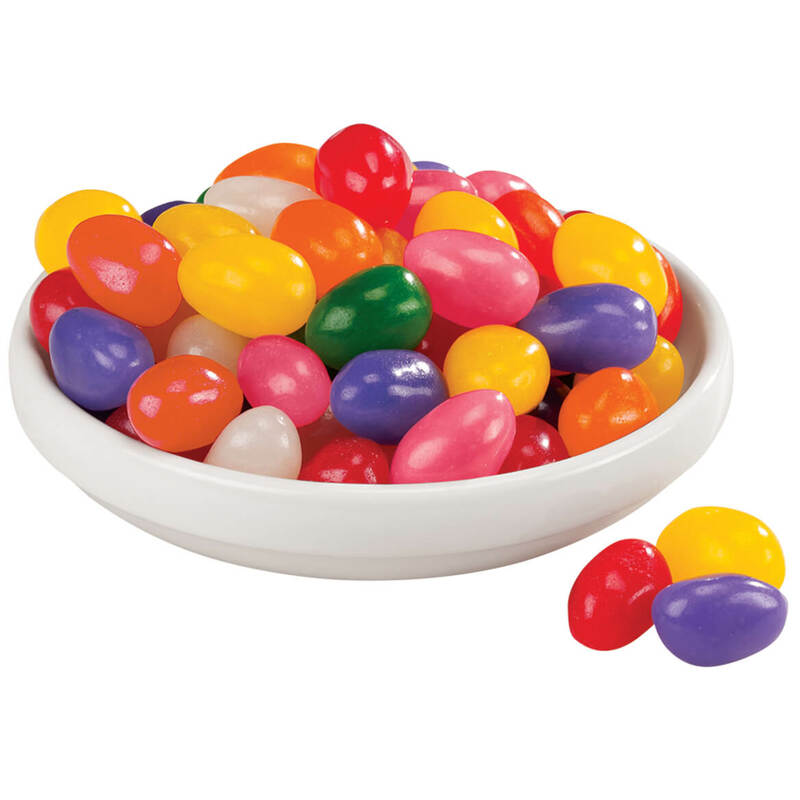 Spicing up Easter like no jelly bean can, Spiced Jelly Bird Eggs treat tastebuds to pure magic! Brach’s uses the perfect blend of sugar and spice to create delicious flavors of Peppermint, Cinnamon, Ginger, Spearmint, Wintergreen, Clove, and Licorice in these classic spiced jelly beans. Boasting bright jewel tones and soft jelly centers, they’re a tasty treat for Easter baskets or candy dishes, and perfect for decorating cookies, cakes and holiday crafts. 15 oz. Bright personalized fabric Easter basket for one eggstremely special girl or boy! Detailed with buttons and ribbon, this custom easter basket has plenty of room for eggs, candy, and treasures—folding flat for storage until next year. We’ll personalize. Specify name; limit 1 line, 12 letters/spaces. Polyester, cotton, plastic; hand wash. Imported. 11″ high x 7 1/2″ diameter. 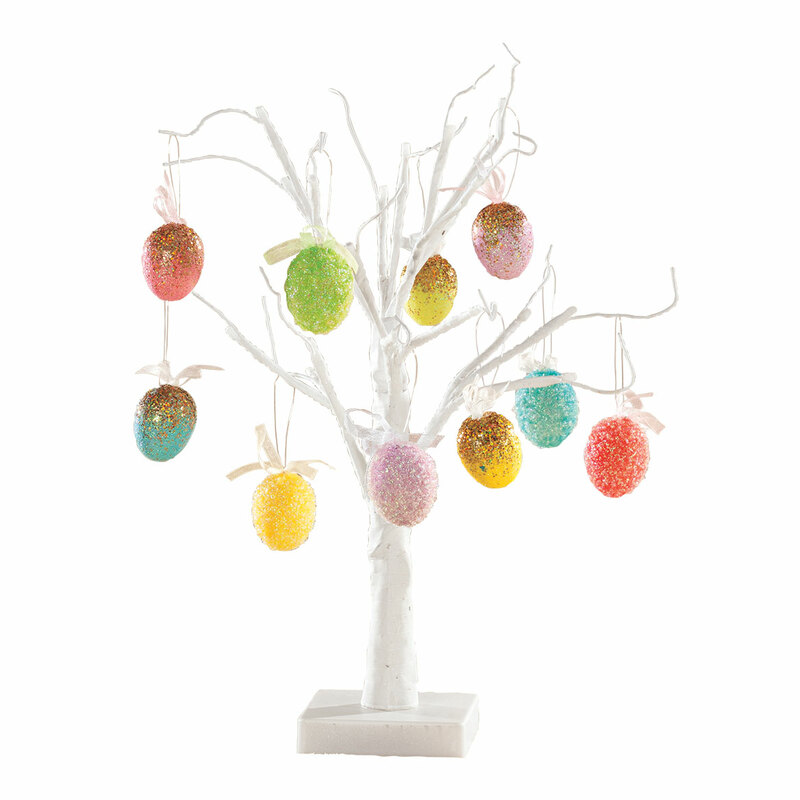 Illuminated with white LED lights, this white wire 18″ tree with egg ornaments is perfect for the spring season or any holiday. The wire branches blend beautifully with decorations. Pre-lit with 18 LED lights, it features on/off switch and timer (6 hours on/18 hours off). Uses 3 AA batteries (not included). 18″H. When combined with the included set of 10 seasonal ornaments, it’s sure to bring festive charm! Ornaments are styrofoam, wire, polyester. Eggs: 2 1/2″ high. 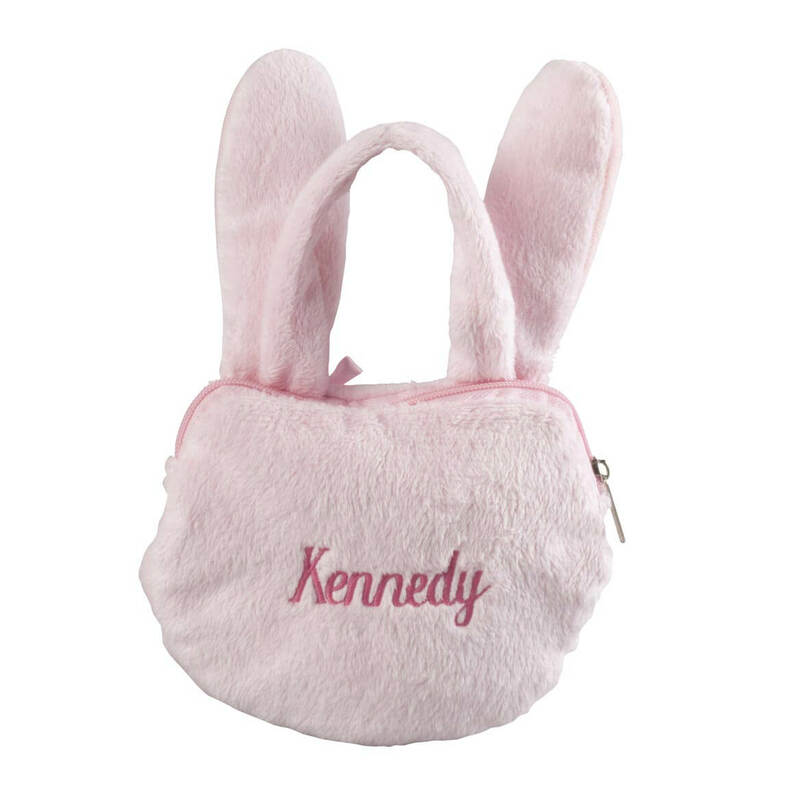 Made specially for one lucky girl, this personalized Easter Bunny coin purse keeps coins, candy and other treasures safe inside its cute zippered pouch. Featuring fun fuzzy ears, cute bunny face, sweet satin bow and soft carrying handle, the plush fabric coin wallet will be custom embroidered with one special name—creating a keepsake treasure. Specify name; limit 1 line, 10 letters/spaces. Coin bag measures 5″ x 8 1/2″. 100% polyester; spot clean. Imported. Fill this personalized Easter Chick treat jar with chocolate eggs, jelly beans or any special treat for a gift the recipient will enjoy now and love every Easter—especially when personalized. 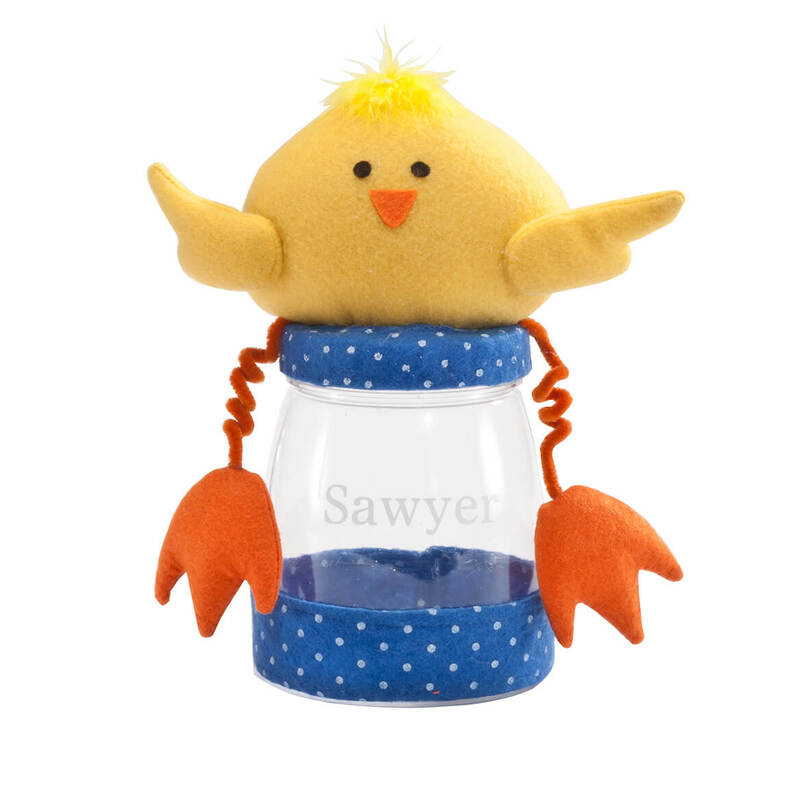 Adorably crafted like a handcrafted treasure, the clear Easter jar’s screw-off lid features a felt chick head, polka-dot trim, yellow chick wings and curly orange legs. We’ll add one special name for a personal touch—you add the treats for an Easter gift that’s egg-stra fun! Specify name; limit 1 line, 8 letters/spaces. Food-safe plastic jar is BPA-free. Polyester fabric; spot clean. 9 1/4″ high x 4 1/4″ dia. Put something eggs-tra special in their basket! This giant personalized easter egg can have a child’s first name and be ready to fill with Easter treats. The 3″ long x 5″ high plastic shell has see-through top with turquoise bottom. Large plastic Easter egg includes decorative “grass”. Specify name, limit 1 line, 12 letters/spaces. Fill this Personalized Easter Lamb Treat Jar with foil-wrapped eggs, bright jelly beans or homemade treats for a gift they’ll love every Easter—especially when personalized. With all the charm of a plush, cuddly toy, the clear Easter jar’s screw-off lid features soft, curly lamb head with little pink ears, polka-dot trim and cute dangling arms. We’ll add one special name for a personal touch—you add the treats for an Easter gift that’s extra sweet. Specify name; limit 1 line, 8 letters/spaces. Food-safe plastic jar is BPA-free. Polyester fabric; spot clean. 9 1/4″ high x 4 1/4″ dia. Get ready for the Easter egg hunt! 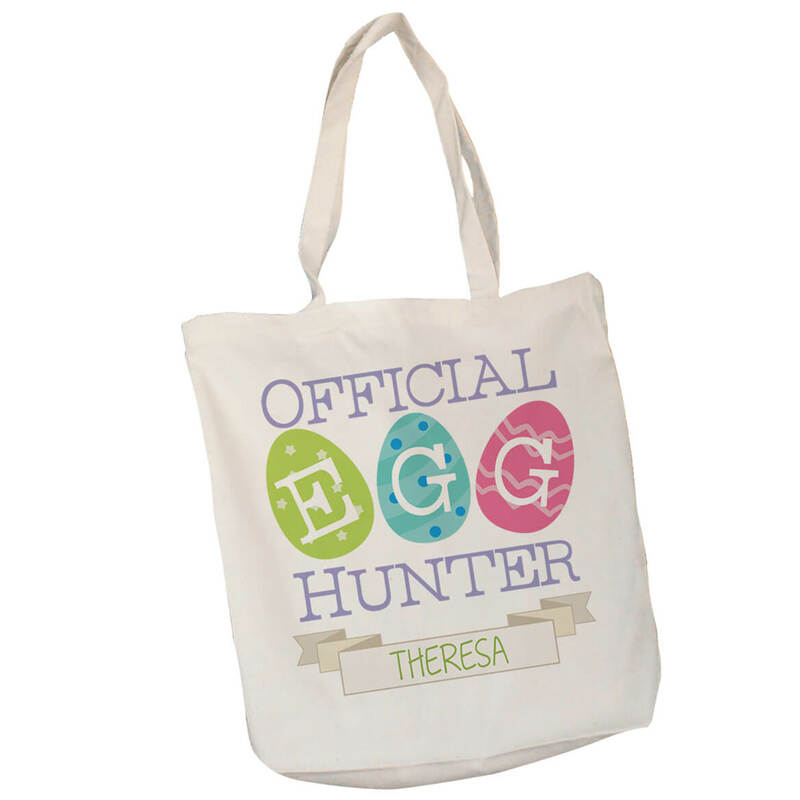 Your little ones will be thrilled to have a spacious personalized Egg Hunter canvas tote bag to put their hunted Easter eggs in. The “Official Egg Hunter” seal of approval will really motivate them to fill this personalized Easter basket alternative with the most treats that they can. Personalization of any name and design color is included. 100% cotton Easter bag. 16″H x 14″W. Reinforced straps to endure small or large loads. Machine washable. Specify name, limit one line; 16 characters. 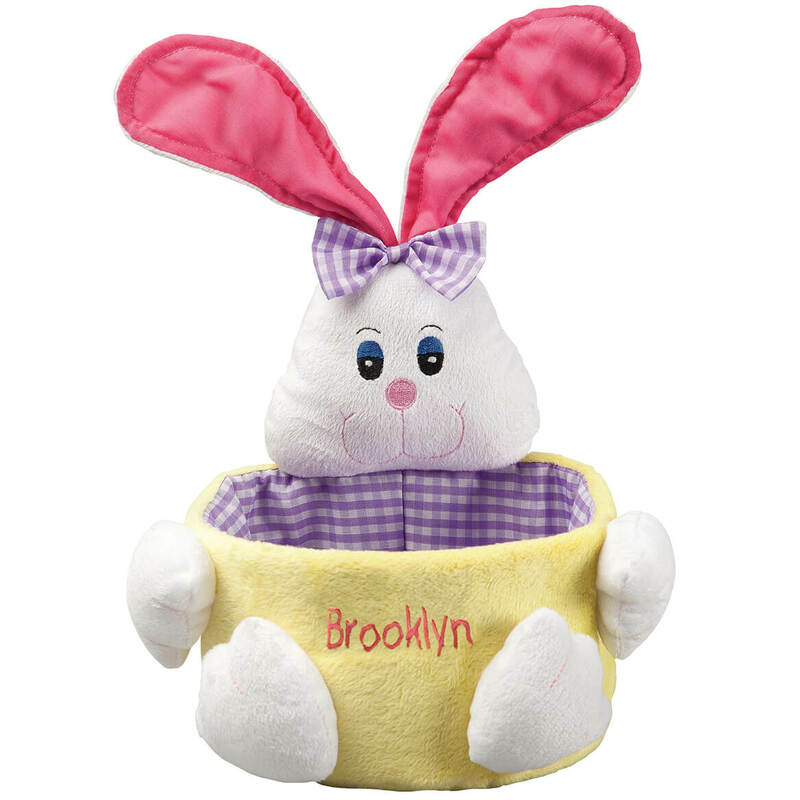 Your hunt for the best kids Easter basket ends here … a personalized keepsake to love every year! 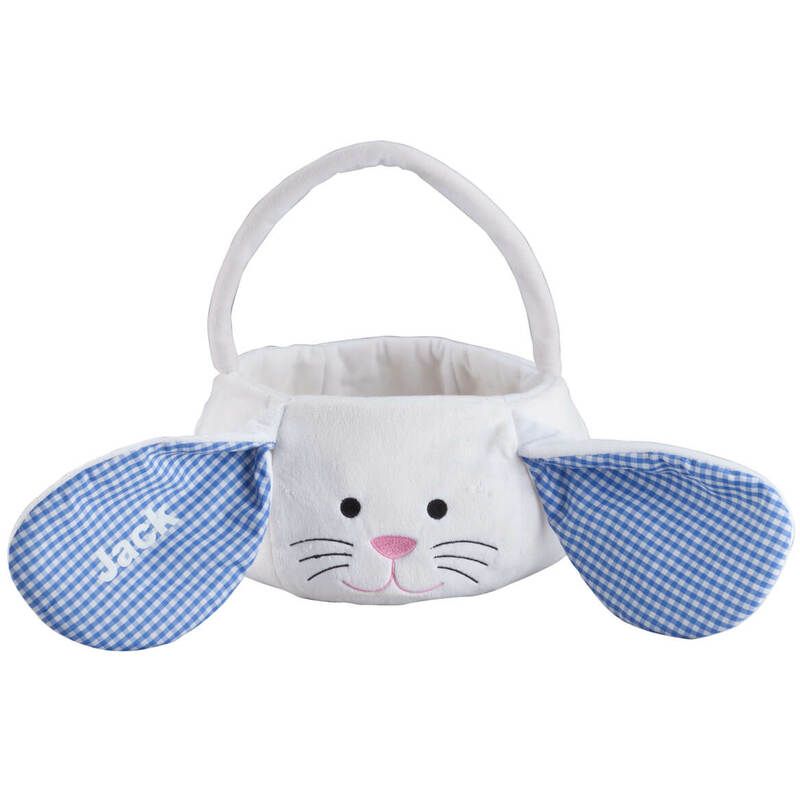 Crafted of soft, snuggly plush with a velvety finish, our personalized Bunny Easter basket has a sweet bunny face and soft, floppy ears lined in pink or blue gingham (where we’ll add one sweet name). Specify color: pink or blue. Specify name; limit 1 line, 10 letters/spaces. 100% polyester; spot clean. Personalized Easter basket measures 9″ dia. x 5″ high (12″ high with handle).